Toss the oxtail with the onion, green onion, garlic, ginger, chile pepper, soy sauce, thyme, salt, and pepper. Heat the vegetable oil in a large skillet over medium-high heat. Brown the oxtail in the skillet until browned all over, about 10 minutes. Place into a pressure cooker, and pour in 1 1/2 cup water. Cook at pressure for 25 minutes, then remove from heat, and remove the lid according to manufacturer's directions. Add the fava beans and allspice berries, and bring to a simmer over medium-high heat. Dissolve the cornstarch in 2 tablespoons water, and stir into the simmering oxtail. Cook and stir a few minutes until the sauce has thickened, and the beans are tender. 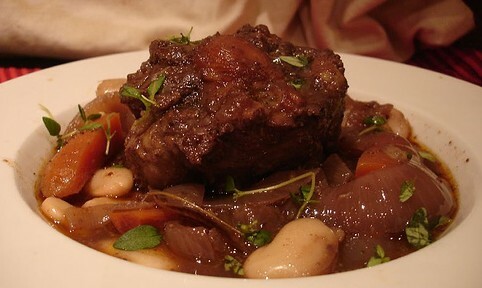 No comments for: "Jamaican Oxtail with Broad Beans Recipe"